While in seminary, I took a wonderful class in Christian art and architecture. One of the most interesting things I learned is that early Christians thought it was idolatrous to depict physical images of Jesus in their art. Therefore, they would use symbols such as the itchus (fish) and anchor to represent their faith. In the third century, attitudes toward depicting Jesus in art began to loosen and biblical scenes from his life began to emerge. The earliest surviving portraits of Jesus are either as an infant or often as a youth, especially as the good shepherd. Most of these images are found in the ancient Christians catacombs. The one that is of most interest to readers of my blog is Jesus as a magician. Yes, that’s what I said! 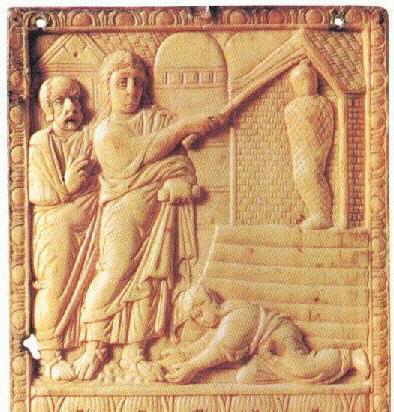 Christ the magician or miracle worker became a common image on ancient Christian sarcophagi. In many of these portraits he is seen as wielding a small staff or wand. There are varying opinions about this depiction but I believe it goes back to the staff of Moses from the Old Testament. In stories such as the parting of the Red Sea and turning the Nile River into blood, Moses’ staff became the conduit of Divine and natural power that brought about these miraculous/magical events. When the writers of the gospels came along, they sometimes wrapped the stories of Moses around Jesus as a commentary that Jesus was the “new Moses” who was leading all of God’s people to a new promised land. 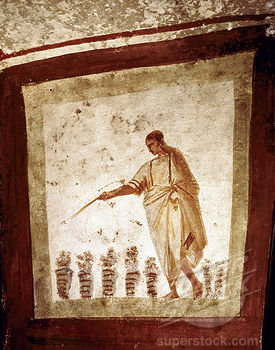 Therefore, the appearance of the staff/wand in early Christian art should come as no big surprise. These early Christians obviously saw Jesus as a miracle worker or magician (in its broadest sense of the word). While there is no evidence in the gospels that Jesus used a wand, this early art image shows that Christians understood him as one who powerfully channeled Divine and natural energies to bring about changes in our world. The stories where this most commonly is depicted in sarcophagi art is Jesus multiplying the loaves and fishes, turning water into wine, and raising Lazarus from the dead. For me, these early art images of “Christ the magician” strengthen the notion that many early Christians had no problem with magic, although they would probably speak of it in terms of miraculous healing and casting out demons. Furthermore, this magical tradition did not end with Jesus. In fact, the book of Acts has a number of stories where the disciples of Jesus performed similar acts to those mentioned in the gospels. Not surprisingly, this also shows up in sarcophagi art with St. Peter using a wand as well! This entry was posted in Jesus, Magic, Spirituality and tagged Christian, Jesus, Spirituality, Wand, Wicca. Bookmark the permalink.